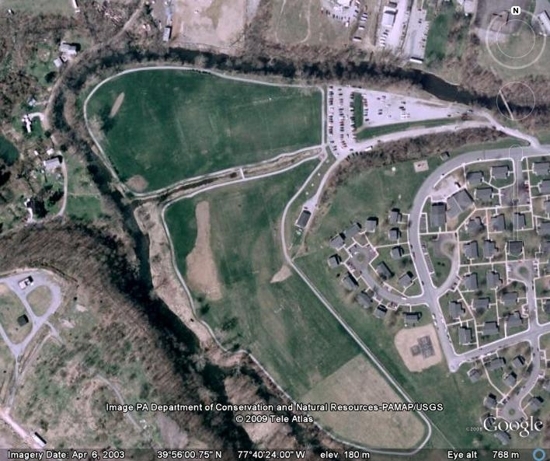 Chambersburg Youth Soccer Association (CYSA) owns and operates a beautiful 19-acre park nestled along the Conococheague Creek. The complex accommodates several soccer fields and a building to house concessions, storage, and restrooms. Surrounding the green space is a 1.2 mile walking/jogging trail known as Chambers Trail as well as ample fishing opportunities along the Conococheague Creek . The Nitterhouse Soccer Complex is located at: 375 West Washington Street, Chambersburg, PA 17201. Chambersburg is located in South Central Pennsylvania and the major routes that get you here are Interstate 81 and US Route 30 and US Route 11. To get to the Nitterhouse Soccer Complex, take exit 16 off of I-81. Proceed west on Rt. 30 until you get to the square (you know you're there when you see the big fountain) in downtown Chambersburg. Take a left at the square onto South Main Street. Proceed two blocks to West Washington Street. Take a right onto West Washington Street. Proceed straight through the first traffic light. The soccer complex will be several hundred yards ahead on the right. There is a sign at the entrance.